In 1915 General Harry Trexler and a group of Allentown civic leaders envisioned a new development on the west side of Allentown. The plan included a "green infrastructure" of hundreds of trees that would line the newly paved streets in the development. These majestic trees are treasured by homeowners and admired by those who walk or drive through the West End neighborhood. But trees have a life span, and trees that were planted 80 to 100 years ago cannot withstand early snow storms and strong hurricanes. Hundreds of trees have been lost in the past year-and-a-half. What were once beautiful tree-lined streets are being reduced to a few old trees and empty spots where majestic trees once stood. After listening to the continuous buzz of saws marking the death of beautiful old trees in the spring of 2012, a group of neighbors decided to take action. The result is the Rose Garden Neighborhood Association's (RGNA) Tree Project whose goal is to plant trees to restore those lost over the years and to work to preserve the remaining trees. At the same time RGNA hopes to recreate the vision of the early planners and preserve their legacy for future homeowners. More than 100 new trees have been planted since October 2012. To celebrate that achievement, each new tree planted through the RGNA Tree Project will be marked with a tag to create further awareness of the effort to replant trees. The tags will provide a link to the RGNA web page where neighbors may obtain further information and sign up to plant trees this fall. The RGNA Tree Project is the result of a partnership among RGNA, the Allentown Parks and Recreation Department, and Walker's Tree Farm. The first point of contact was the Allentown Parks and Recreation Department, from whom the group has received unwavering support. City arborists Rick Howells and Rick Holtzman guided neighbors through the requirements for planting trees in the verge (grassy area between the sidewalk and curb), made recommendations about what species to plant, visited the Walker Tree Farm to assess the overall quality and health of the trees, issued a group permit, and coordinated the PA1 calls for each property involved in the effort. They also worked with many neighbors to assess the health of trees and to recommend appropriate steps to remove hazardous trees. "The results have been amazing," states Rick Holtzman, Parks Superintendent. "I wish we could duplicate this project throughout the city. I am impressed with how the neighbors have embraced this initiative and how well the collaboration has worked. The new trees that have been planted are already having a significant impact in the area. I hope to continue to support this project as long as neighbors are interested in planting trees." The Walker Tree Farm, a 100 year-old tree farm in Lehighton, PA, planted trees at a very reasonable price. David Walker met with home owners to determine needs and preferences and to help place trees along the verge or in the yard. Later he would return to plant the trees. Many neighbors made a quick trip up to Lehighton to select trees. Welcoming RGNA neighbors to the Walker Tree Farm in Lehighton and helping reforest the neighborhood has been a pleasure for David Walker. When asked to comment about the RGNA project , he says: " It's great to see neighborhoods work together to achieve a goal. We can achieve more, do it in less time and at a lower cost for all. I am glad we were able to help out with this project." Tree Inspector Rick Howells has worked closely with the group. "Working with this project has been very rewarding," according to Rick. "I feel good that we developed an easy and convenient process for RGNA neighbors. I am looking forward to next fall when we'll see new color from the leaves of all the new trees, but I especially look forward to restoring the beauty of the tree-lined streets that define this area." One of the benefits of planting trees in general is building community, and this project not only succeeded in planting trees, but has helped bring neighbors together around a common goal. The project was the result of neighbors working together to gather information, develop a process, identify resources, and encourage others to participate. For every cluster of new trees along a street or at an intersection, there is a neighbor who coordinated the effort. Another group of volunteers worked on a tree survey to determine how many trees needed to be replanted and to increase homeowner awareness of the project. A third group, the RGNA Park and Garden Committee, coordinated the overall project. Many others have helped with communications, graphic design, hosting meetings, distributing flyers and sharing information with neighbors. Overall, 54 households have participated in the two initiatives, planting more than 100 trees. Several varieties of trees were planted, including maples (Legacy Sugar, October Glory, Autumn Radiance, Red Sunset, and Sun Valley); oaks (Pin Oaks and Red Oaks); Serviceberries (Autumn Brilliance); Locusts; and Hawthorns. Several other varieties, including Dogwoods and a Norway Firs, were planted in yards. Participants have been enthusiastic. One barrier to replacing trees is having the time to do all the research and go through the steps necessary to plant a tree. The Tree Project simplifies this process. "Planting trees through the RGNA and Walker partnership was seamless. Once we expressed interest in planting two new trees in the verge, a meeting was established to discuss type and placement. 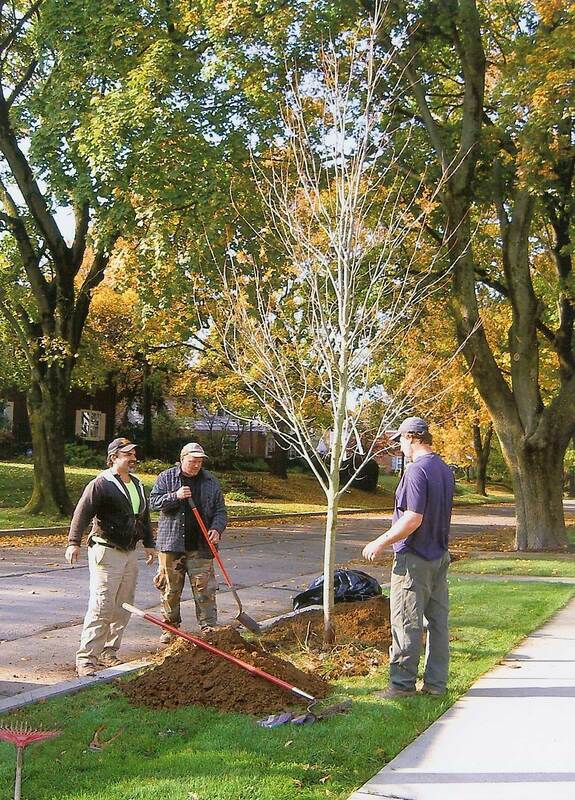 We were put on a schedule and our trees were planted quickly and professionally. It was completely turnkey, very reasonably priced and the trees are doing beautifully. It was so easy, we are looking forward to repeating the process again this fall," reports Amy Douglass, a working mother who leads a busy life. Carl Andrews and Bret Hauber moved to into the neighborhood recently. Once they learned about the Tree Project, they got involved. "We were delighted to learn of the RGNA group sponsoring the Tree Project. I think what really resonated with us was viewing the aerial photo of the West End from the 1930s. We couldn't believe how lush and full of trees the West End used to be. It got us thinking about what had happened over the last 80 or 90 years? Had people just forgotten about planting trees? Of course there was last year's hurricane, which seemed to bring down trees on each and every block. After hearing about the RGNA initiative we were definitely up for the challenge. " Like other neighbors, Carl and Bret had some research to do. They received assistance from several sources. "We knew there would be any number of considerations and questions but we didn't know how much fun it would be to find out the answers," states Carl. "Fortunately, we were put in touch with Rick Howells from Allentown Parks Department. He was crucial in helping us determine which trees would suit our verge. One of our biggest concern was ensuring that the trees didn't interfere with the power lines. We were also concerned about the long term possibility of having the tree roots disrupt the sidewalk. Fortunately, we were in good hands. We decided that the Serviceberry (tree - not shrub) was the best option for our stretch of 30th Street." Working with their neighbors who were also interested in planting trees, they made a group decision "... to take our stretch of 30th street from starved barren strips of land to lush green belts that provide foliage, shade, and habitat for birds. We are thrilled to be a part of greening up Allentown." Lynn Yonally, a strong supporter of the Tree Project, states that "...several neighbors have mentioned that we are renewing the pledge the original owners of this beautiful neighborhood made when they planted the original trees. They may not have had the joy of seeing the trees reach maturity during their lifetime, but they knew that the next generation would. We want to give back to future generations as the past generation did for us. " She also feels good about planting trees to combat global warming and to create a healthier environment. "We also are being proactive in the fight to create more green canopy to combat global warming. More blacktop and roads will heat the air and tree canopy can help shelter the streets from the sun and heat. When you drive down a road with shade it is significantly cooler than a roadway without trees." The members of the RGNA Park and Garden Committee are excited about the results of the project. "By buying trees in quantity directly from a city-approved tree farm, we have saved our RGNA neighbors approximately 50% off the regular price of a planted tree. We hope that other RGNA neighbors will join us in this worthwhile cause by going to www.rosegarden-na.org for further information," says Ellie Laubner, one of the organizers of the project. Given the success of this first initiative, RGNA will continue to promote the Tree Project as long as there is enough interest in planting trees and volunteers to help make it happen. There are already more than 10 trees on the list for fall 2013. Join the RGNA Park and Garden Committee to "reforest" the West End! Click here to sign up for the Fall planting project.